Shani Bhagavan is the Hindu Lord of Saturday and the planet of Saturn personified. In India devotees make offerings to him on Saturdays. 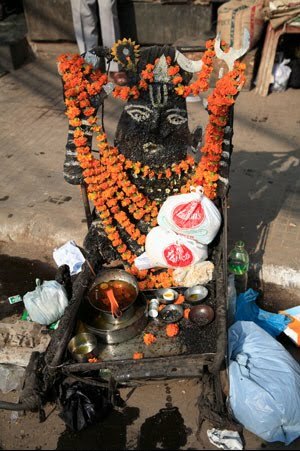 We came across this makeshift street side shrine of Shani in one of Old Delhi’s narrow lanes. He grants wealth and good fortune to those who do good deeds. If you aren’t the good deed type he’ll make you miserable. Shani is typically shown in a dark color holding swords and arrows. Devotees often wear black on Saturdays to stay on his good side. The offerings you see pictured include fruit (in the plastic bags), flowers and mustard oil incense. I stumbled across another such shrine in Lake Charles, Louisiana, of all unlikely places. It surprised me. It shouldn't have. I was born on Saturday and so was my daughter. I've never heard of Shani but he sounds like a good deity to pay attention to! very interesting. first time of heard of this god. Thank you all for stopping by and glad you enjoyed.